One of the biggest shifts in business thinking for many years has been the adaption of online technologies. By using digital methods of marketing, research and distribution, the modern business is now able to enjoy a much greater breadth of operations if they practice good change management strategies. However, these changes pose an interesting question for our towns and cities, with many feeling the effects of the rise of the online store. 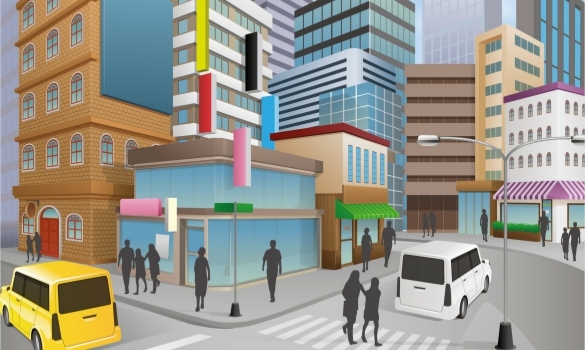 So what will our high streets look like in the future? First things first, before you question what the high streets of the future will look like, you need to know what high street is right now. High street is another way of saying Main street. High street is the primary retail and shopping center in any town all over the world. These commercial centers are typically home to a plethora of different sized businesses, from small family owned businesses to large chain franchises. You may stumble upon a popular pizza franchise location or a tiny, woman owned enterprise that sells luxury paper products. Now, you may find services and shops, like pharmacies, pubs, restaurants, clothing stores, post offices and similar at your local High Street or Main Street. But, what retail spaces will there be in the future? Not many, if the ecommerce industry has anything to say about it. The effects of the power of online shopping can be seen all over the world through the sheer volume of vacant stores in city centres. In the UK the closure of many popular high street shops such as Woolworths and Borders has left many town centres feeling strangely derelict. And similarly, in Canada the huge discount retailer Target made a hurried exit from shopping complexes across the nation in a bid to not lose any more money due to high prices and poor location planning. Such examples point to the unfortunate fact that these businesses have struggled to adapt to the new online shopping environment that requires physical shops to offer a little more thought into how to cater for the rise of the digital customer. The phenomenal growth of online shopping opportunities has caught many by surprise. But from massive multinational companies such as Amazon to specialised clothing retailers such as Boohoo, there have been many enterprising companies who have sought to reap the benefits of the game-changing system of online retail. These include popular small start-ups that use the latest cloud computing trends in conjunction with online enterprise to quickly supply the new niche markets in Canada. By being to operate without a high street location, such stores are able to take advantage of lower overheads and can instead divert funds into providing a greater level of online marketing and a better range of products. And many industries have been given a complete overhaul, as seen in the rise of online casino sites such as Uptown Aces that are able to provide range of specialized games and online giveaways that can be enjoyed at the player’s convenience. And what makes sites like these so successful is the way that they can be used by a huge range customer from a massive range of locals. However, all is not lost for the high street store. Many physical retail outlets have found an ability to survive in difficult circumstances by offering an advanced level of specialization that is able to take advantage of local attributes and a degree of customer loyalty. The growing retail food business is a great example of this. And this has seen some impressive results with 70% of Canadian retailers attributing half of all sales being derived from a physical environment, according to a Deloitte study. Such statistics are thought to be derived from the fact that the majority of consumers still enjoy the human interaction that takes place in high street stores. Clearly, it is worth it to have high quality digital signage ideas to entertain and assist retail customers. Of course, there are some companies who use physical location to their advantage such as a yarn company that features a mobile truck to far-flung regions. And similarly, the ability to experience a tactile relationship with the products being purchased looks like something that will never be enjoyed by their online counterparts. There is some comedic irony to this high street downturn facing most American cities. A cloud IT company, arguably part of the problem for local main street shopping, has named themselves Highstreet. Highstreet offers cloud IT services, in addition to network solutions, Oracle cloud applications and Peoplesoft. This company operates out of Colorado, but not on a main street. If you are unconcerned with the fall of the main street shopping opportunities and just looking for cloud IT services for your business, consider Highstreet. At least you know you will get a laugh the next time the business podcasts you listen to talk about effects technology have had on small business.